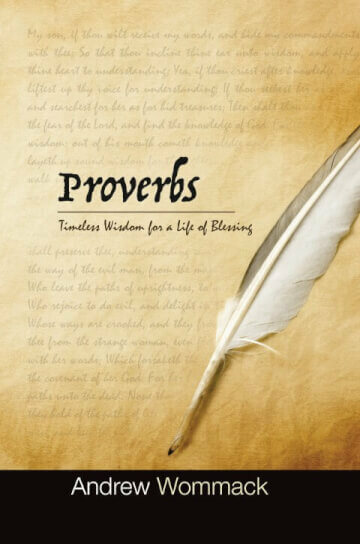 The book of Proverbs stresses the value of the principles found within it: “To know wisdom and instruction; to perceive the words of understanding;  To receive the instruction of wisdom” (Prov. 1:2-3). The Bible says that these words give “subtilty to the simple, to the young man knowledge and discretion” (Prov. 1:4). That word “subtilty” simply means good judgment or common sense. It’s easy to see that our society has drastically departed from common sense. Unfortunately, the church isn’t far behind. People neglect learning about the things that will help them and make them spiritually healthy, like the book of Proverbs; they just want the feel-good stuff. They would rather go straight for dessert and bypass the vegetables! Jesus Himself described the importance of studying the Word of God when He said, “If ye continue in my word, then are ye my disciples indeed;  And ye shall know the truth, and the truth shall make you free” (John 8:31-32). So, meditating on these truths will keep us from being fooled by the devil and his agents. It will make us free! Another thing that’s wrapped up in the first few verses of Proverbs is what these proverbs help us do: “to perceive the words of understanding” and “to receive the instruction of wisdom” (Prov. 1:2-3). It’s the Lord’s will that everyone should have wisdom and understanding. Ephesians 5:17 says to “be ye not unwise, but understanding what the will of the Lord is.” It’s never God who doesn’t give, but we who don’t receive. That’s why Proverbs places the emphasis on us receiving these things. One way to receive these things is to follow what Solomon said in Proverbs 4:21, “Let [these words] not depart from thine eyes; keep them in the midst of thine heart” (brackets added). In other words, we can’t just put God and our relationship with Him over in a corner somewhere. He needs to be the central figure. Our eyes should never depart from His Word. This isn’t talking about physically but, rather, saying that our focus has to always be on God’s Word. Proverbs shows not only the purpose of studying the Word but also that hearing the Word is just as important. "A wise man will hear, and will increase learning; and a man of understanding shall attain unto wise counsels." This verse clearly states that a wise person will hear, and as they hear, they will increase. This book isn’t only for those who don’t have knowledge and who are totally simple - without understanding. The book of Proverbs is for everyone. Proverbs 4:20 says, “My son, attend to my words; incline thine ear unto my sayings.” It’s not enough to just read a daily Bible chapter or the verse of the day. Reading the Bible is important - vital even - but we can get even more out of the Word by also hearing (Rom. 10:17). We should make it a point to listen to good teaching on the Word of God. Hearing the Word is so important that the Bible says it will even extend your life (Prov. 4:10). This is one reason many of my teachings, including this one, are available on CD and DVD, and most can be download for free from our website. You can hear teaching over and over and really get it down in you . "The tongue of the wise useth knowledge aright: but the mouth of fools poureth out foolishness." "A wholesome tongue is a tree of life: but perverseness therein is a breach in the spirit." "The lips of the wise disperse knowledge: but the heart of the foolish doeth not so." The words we speak are powerful. Those who are wise will use their words wisely, but sad to say, most people don’t understand the power that’s in their words. They’ll say terrible things about themselves and others, and they’re hung by their tongues. That’s a sign of not being wise. “A wholesome tongue is a tree of life” means a wholesome tongue is life-giving. It’s the source of everything. Our lives are linked to the words we say. What we say is what we get; that’s what the Bible tells us. The word “wholesome” means “a medicine,” “a cure,” or “deliverance” (Strong’s Concordance). In other words, a wholesome tongue - what we say - is what will cure us. Our words can literally cure us or make us sick. The Word of God is health to all our flesh (Prov. 4:22). If we would take the Word of God, meditate on it (Josh. 1:8), not let it depart from our eyes, and keep it in the midst of our hearts, it would become life and health to us. The Word of God works! But we have to get it in us and then allow it to flow out of us. "Wisdom is the principal thing; therefore get wisdom: and with all thy getting get understanding." Download full PDF of the May newsletter.